Explanation: Sometimes it is hard to believe what you see in the sky. While leading his annual aurora tour last month near Fairbanks in central Alaska, astrophotographer John Chumack and his company saw a most unusual aurora. 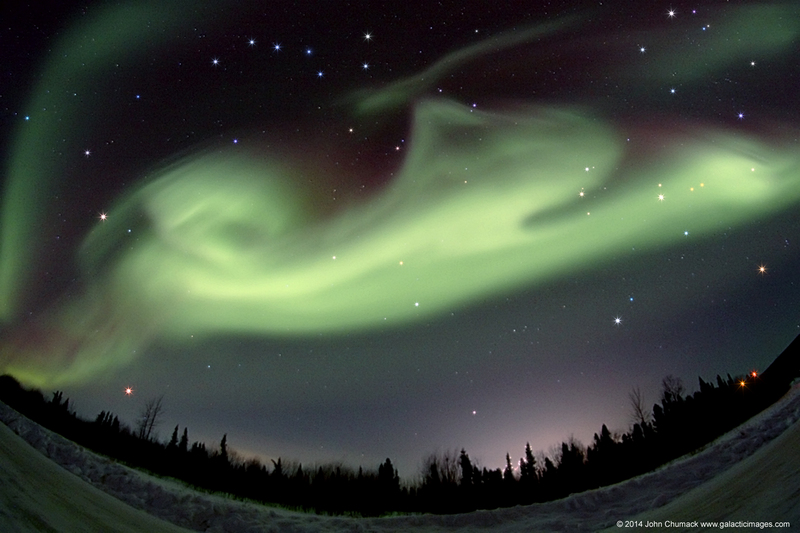 This bright aurora appeared to change into the shape of a jumping dog, complete with a curly tail. He was able to capture the fleeting natural apparition in the above image with a 15-second exposure through a wide-angle lens. By coincidence, he also captured a background sky filled with familiar highlights. Planets visible include bright Jupiter through the dog's front legs and reddish Mars below the dog's hind legs. Stars visible include the Big Dipper stars above the dog's midsection and reddish Betelgeuse shining on the far right. This dog would not be following him home, however, and within a few minutes morphed into other shapes before the geomagnetic storm particles that created it shifted to strike the Earth elsewhere.